I started a new series of videos where I will explain my process, progress and reasons behind modelling my strokes after specific professional players. I started with the notorious Roger Federer Forehand. The primary motivation for this is to put an end to players and coaches trying to copy certain strokes of professional players without seeing the whole picture. They just try to get strokes mechanics right, but without the proper grips and racket specifications, the stroke they are modelling will never work the way they want. In the first video, you can see a compilation of some of my forehands and how it looks now. I also talk about the theory that I applied when selecting the correct racket specs and so on. I'd like to know your input as a player/coach if you approach this the same way when you try to imitate a specific player's strokes. For now, I’m satisfied with the progress and the results on the court. However, as I say in the video, everything is always a work in progress and I learn every day with the goal of bringing you better content and to transfer more knowledge to the players willing to learn and improve. I also welcome any kind of feedback and suggestions on what to improve and work on next. Can you copy the Gulbis forehand? what's that soundtrack at the end? I’m right handed but my forehand is like nadals. Do you want videos? Great post. Would be more suited to the tips and instructions section, I think. Not sure if you are serious, but if you are, I wouldn't mind. And if possible explain how you achieved in detail. Thank you! I'm not sure, I would like this to be a general thread about modelling strokes after pro players, where we would discuss how to do it. But if the moderators find it more suitable there, than it can be moved for sure. I'd forget Federer's since that requires too much timing or Nadal's since that requires too much RHS. Djokovic is best to emulate since it's textbook. I agree about Djokovic having the most textbook forehand, but only for his grip. And also having a textbook forehand doesn't give you an edge, because everyone is being tough a textbook forehand. 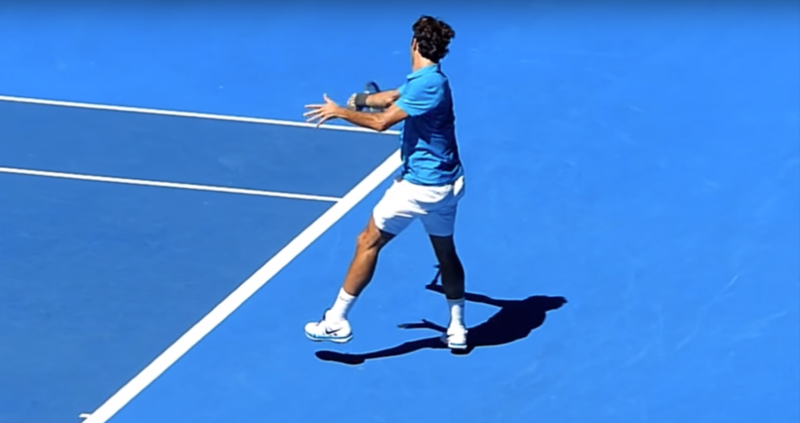 Federer's forehand if done correctly is very easy to execute and to time it well. Everybody just thinks that, but what is timing really? I guess you would say that because of the racket face position, that changes vertically just before the contact in Federer's case, but the correct grip, coupled with the straight arm and correct racket specs, takes care of the contact point and racket face position and timing really isn't a problem to get right every time. Why not post a video of yourself from the rear hitting up the middle for a few minutes instead of a handful of individual forehands from a bad angle? Everyone should model their strokes after Gilles Simon. So freaking compact and simple. I model my beard after his. Weak sauce. Gotta up your beard game J.
Gotta walk before I can run. I just posted about this. To me for a VERY basic stroke you could look to Tomic. A little more pop and form, look at older bro Zverev, and for a complete stroke I would say Stan or Kohlschreiber. Good forehand but little too much emphasis on arm. No one can truly replicate Federer's forehand, not even Dimitrov, its unique to Federer. You are in the right direction but its not 100% like Rogers. Don't copy pros' forehands. Invent your own. Be Original. My strokes are modeled after Federer. Thought it was the other way round. The better idea is to understand the commonalities among all good forehands. The shape and timing of the turn and set up and the key points in the outward swing. There is a lot of emphasis on the various backswing shapes and automatic movements that occur in the process as well as misleading concepts like lag and snap, etc. If you have a reasonable grip for your level, a great turn, and extension in the forward swing you will have a great forehand. Hey Miha, you are doing some good job covering those things and going after high-quality presentation. Thumbs up! Hi Fliiix, could you post a side by side video comparison? I cant see the similarities in your video. What about Amy Frazier's backhand? First of all, why I went for the Federer forehand. Every time I'm on the court I just can't wait to play the next point or hit the next shot, because it feels soo good and the ceiling of the shot is so high. I think that's also a big part of Federer's sucess. He plays every point to hit great shots and not to win the point I think. I just recently started the youtube and now filming some of my matches and on some court I can't fix the camera from the rear. I'll try to stick to back view in the future and also post some forehand drills. Compact and simple, but not a very high ceiling in my opinion. The reason I went for Federer is because of the high ceiling. I searched him on yutube...first time I have seen him haha Simple and does the job. There are some younger players also with a similar serve motion like Nicolar Jarry. Like I mentioned at the beginning of this post. The most important thing to me is the ceiling of the stroke that I'm modelling. Stan and Kohlschreiber would certainly fit in the high ceiling category, but someone like Mischa doesn't. 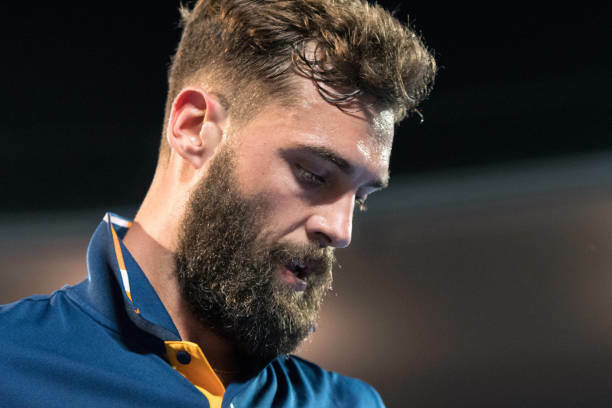 Although his forehand was modelled with the net approach in mind I think, because of how comapct it is, it gives him more time to go forward, so a forehand like his might fit well and have a higher ceiling with a specific game plan. But I do agree everyone is uniqe in their own way. There is a reason why I say modell and not copy hah. You can model the fundamental principles of certain strokes that you think a pro does well, and then put your own twist to it. The message I would like to put out is that by analyzing pros stroke mechanics and their racket specs, we can derive what certain specs are good for (in my example Federer's forehand) and then use this knowledge. This is exactly my point/message here. But some elements can only be achieved with the correct grip and racket specs. And I'm not only talking about the Federer forehand. For example, you can never finish your strokes on the forehand side below your shoulder if you are using a very closed grip (western or more extreme) and expect the ball to consistently clear the net. I think I might have that from the times when I used a more head heavy and polarized racket. I'll definetly try to work on this. Any tips on how to work on that or at least the mindset that goes into limiting the rotation? I'm just starting with the youtube and I'm not sure jet what video material I can legally use. If I find a way I'll definitely do something like that in the future. First of all, why I want for the Federer forehand. Every time I'm on the court I just can't wait to play the next point or hit the next shot, because it feels soo good and the ceiling of the shot is so high. I think that's also a big part of Federer's sucess. He plays every point to hit great shots and not to win the point I think. If you can't do rear view on your court straight from the side in line with the baseline is also good. It's the angles that make it tough. You need to compare your forehand side-by-side to high level forehands using Kinovea. Strokes are hard to compare when you have to remember what was in a second video and you have never noticed the stroke feature. Here is a Federer forehand from Fuzzy Yellow Balls. Look at some of the faster forehands later in the video. Now take your forehands and compare the motion of the off arm in your forehands to the motion of the off arm in Federer's video. Notice the time of the Federer forehand over which the highest speed object is the off hand. What purpose does that motion have? Timing? Your off hand is used very differently than Federer's. We have had recent threads discussing the purpose of the off arm motion in the forehand. In side-by-side videos, the off hand differences between your forehand and Federer's would jump out. Do the same with the issue of separation, also recently discussed in threads. Separation involves a turning of the upper body as indicated by a line between the shoulders, back or forward, farther than the line between the two hips. These lines form a separation angle when viewed from above. Separation angle involves how the stretch shorten cycle of the abdominal muscles are used and other body turn forces. Separation on the forehand, Frank Salazar forehand overhead view by Fuzzy Yellow Balls video. 1) start with incoming non-pressuring balls that do not require running. What does the player do when he is not pressured and wants to hit pace? Hopefully, that would be their best biomechanics. Practice rallies are not the best choice unless they are intense. 2) when that simpler stroke is understood, do running wide to the sides or other variations. Federer dealt with back injury issues from about 2013-2015. Don't select Youtube videos when player's strokes may have been affected or modified by injury. These biomechanics references present overall biomechanics of tennis strokes from a reasonable viewpoint. Unfortunately the prices have gone sharply up as perhaps the ITF has sold its stock of copies and quality replacement texts have not appeared. To do side-by-side videos, Kinovea does an excellent job. It is free, open source, very capable and easy to use. Any tips on how to work on that or at least the mindset that goes into limiting the rotation? Tough question actually. I'm more of "just do it" type of learner. So go like try - get the feel - look which kind of ball it produces - verify on video. The first step I believe is getting the feel of "release", when you speed up your arm and racquet, then this acceleration performed by torso rotation is complete, and only then, in a fraction of second, impact occurs. Shadow swing practice may help doing burst hip rotations with your arm rotating into lagged position (elbom forward for me as a focus point) and looking how arm comes forward and wraps then around torso as soon as the burst is done. So, don't lengthen the hip-torso rotation/acceleration phase, it should take just what it takes Another pair of tips may be swinging outward to the ball and maybe contacting the ball a tad less in-front, still with good sideways spacing (at least not worry much about the contact point, unless video clearly shows being late). Here I cut two forehands of mine to compare. Second one was hit a tad more energetic, but technique-wise it had longer body rotation through the shot, making me tighten my shoulder and arm to get racquet to contact in-front. While first one was of a series which felt effortless, balls where at least same pace and shape, and I hardly missed a shot. Thank you, didn't know about Kinovea, very usefull and not just for tennis. I'm aware of my off hand...have to try and include it. One drill I'm doing is try to cahtch the racket on the followthrou while shadow swinging, with the off hand like Federer does. Also, like you mentioned I shouldn't use videos from the injury periods. I think I should also just focus on the seasons where he is palying with the new racket (quite different specs and stroke mecahnics). I'm thinking of using 2017 season video for sid eby side comparison in the future. Does anyone have any experience with using videos of pros for comparisons etc? How does youtube tolerate this etc. My approach to tennis is very purpose oriented. I try to do as much as possible during my limited time on the court and when I go on the court I like to have a clear idea of what I'm trying to work on and to see if it works. Thank you for the comment. I guess the best way to think about limiting the torso rotation would be to wrap the arm arund the torso and not let the racket/arm to lead the torso rotation. I agree w/ simon being good to model. I modelled myself on wawrinka cos i have a 1hander. Both are good. Compact strokes that force you to use ur body. Strokes that have a good balance of spin and depth, you need that arc for consistency. Why are you doing this? The pros of the present are not the ideals to imitate. @Fliiix You mention using a Blade 99 and saying its not ideal. Have you tried using the Wilson RF97 racquet? For a long time now I 'm thinking about switching to a 1 hander too, maybe this will be the stroke after the serve to model. =D I always found that for a very good 2HBH completely different specs are required than for a forehand and a serve, at least for the style of the forehand that I always try to advocate and develop. I just can't agree on the Simon part, although many people like his strokes. They are simple, hard to get wrong etc. but they just have a low ceiling. I guess you are trying to say that the newer generations have better strokes? Yes, I have. I only have a couple hours with it now but I'll make some videos on the progress with the RF in the future. I made a video of my initial thoughts though. No, the current pros are horrible examples. I kind of get what people are saying in regard to Simon, but I disagree. I think the ceiling on his strokes is pretty high. I wouldn't say it's as high as Fed or Wawrinka, or some of the other bigger guys, but he can punish the ball when he wants to. The thing is, Simon is a player that likes to make you question your ability to beat him. He's not the type of player that is going to try and blow you off the court. While he's 6ft tall he's only about 150lbs., so IMO he's making a smart choice to play a little safer and make people try to take points from him. He can rip winners when he wants to or needs to, it's just not the best strategy for him. Does OP actually play tennis or just fool around with strokes and racquets? So you are suggesting the best strokes come from let's say 80s? I would say anyone trying to breed that kind of style, definitely go for the Simon style strokes, alongside with similar racket specs (depolarized and multi strings). But I also have a lot of fun exploiting and learning about the technical side of tennis as my income is not reliant on my tennis results like what is the case with professional players and they often don't want to risk changing anything. I don't know where to begin, but I definitely don's see Nadal using his index finger the way you do. I see this with some players and it just hurts to watch. Not much in common there besides the "helicopter" follow-through . Maybe you improved since then? No I don't know what your specs are but judging by your mechanics the racket is pretty depolarized and for a "Nadal forehand" you need a polarized racket. Let me also say that Nadal is not hitting his forehand this way on purpose. If you watch some of his training sessions he uses a nice followthrough when he is in position and so on. Even Federer follows through over his head sometimes when necessary. I just watched a utube where the guy said DJ had been using a 370 wt and he has a pretty solid 2 hander. WHy Fed Fh and serve? Well I mean I'd take the Fed FH and serve. Those 4.0 ladies in 9.0 wouldn't know what hit them! Which serve would you pick to have? Roddick. Every day of the week and twice on Sunday. Now imagine having Roddick's serve with Fed's accuracy. Forget about Federer's racquet spec. Just do you. You're hella neurotic about all of this, lol. Personally I never liked the SW~335 with highly headlight balance. I find strong headlight balance racquets to be overrated. Anyway, what about Djokovic's backhand? Most people seem to copy his BH, or at least they try to..
Roddick's serve was plenty accurate. It could be the most underrated shot in the history of our sport. People just remember Roddick towards the end. His serve was utterly devastating in his prime. When you speak of "the whole picture", that's just it, no one can ever mimic "the whole picture." They can only try to execute bits and pieces, and try to get as many right as possible. Even getting a few right is going to produce better results than the player who has nothing. I'm not really sure what you mean by "never work the way they want"...sure, a rec player will never have the control and power of a pro, but do you really think they are doing more harm than good to their game by trying incorporate mechanics from pros? I don't see this. IMO, you can't knock coaches for trying to get their students to try to mimic Federers strokes, or any pro strokes, as ultimately they are the best demonstrations available. They also serve as motivation for players, and get learners excited about the sport, to try to play like their tennis heroes. Does Roddick’s serve get underrated? I’ve always thought of his serve evolutionary. Sort of brute force of nature that just bludgeoned opponents. His forehand used to be monstrous, too. Too bad he didn’t develop a good net game earlier in his career. Might have won more grand slams. He really brought another level of serves to the game. Heavy spin with massive velocities that others could only approach by flattening out a bit. I guess you were watching the Racquet Tech guy? Than he also mentioned a lot of other racket parameteres and not only weight. Djokovic has a static weight of around 360 and SW of 370 and a less head light balance (around 32,8 cm). These are very different specs than mine and very good for a 2HBH. For now the closest to what I'm looking for might be Berdich. He is using a very headlight racket for a 2HBH. 1. I'm using the same FH grip (eastern/semi western), so a headlight balance with high MGR/I naturally suits my FH. 2. I enjoy heavy rackets as they have a much higher ceiling and they force me to stay in good shape to play competitive tennis. 3. I have a platform stance on the serve and combined with similar racket specs like fed, his service motion or something similair is the only thing that really works. Feliciano Lopez has similar specs (considering he uses an extended racket) and service motion but is tailored for the pinpoint stance. 4. His strokes are fluid, efficient and consequentially Antifragile (https://impactingtennis.com/pro_tour/antifragile-2/) as I mention in the video. Part of the reason for that is the high static weight and high MGR/I. Both serves are very different and the main reason for that are 2 very different rackets. Fed's racket can't produce cracking serves like the extended pure drive in Roddick's hands can and vice versa for the variety accuracy and spins. Some people might find what I'm doing neurotic, but as much as I try to avoid judging anyone, I find a lot of people ignorant when it comes to equipment. I mean I can't force my principles to anyone, but for the people that see the value in this and want to learn and improve I try to document my process and findings. Off course these specs are not for everyone. The most important here is the FH grip and the stroke mechanics. I guess there are 2 approaches that players can take. Build the strokes mechanics around the specs they have or the specs around the strokes they have. And this really is the essence of what I'm trying to communicate to you all here. Now I would say that your stroke mechanics didn't work for this kind of specs. Do you mind posting what do you use now and what you find to suit your strokes the best? And about Djokovic's 2HBH, I just answered above to 5263. I agree on that, but that's not exactly what I mean with "the whole picture". It's more about understanding what even makes certain strokes possible. I'm not knocking anyone, although I can see why I might come off like that. I just try to clear some of the misconceptions. If I break it down a bit and simplify what I'm trying to say... I want players and coaches to understand that, for example, buying a stock Pure Aero and trying to model Nadal's strokes won't work how you want it to work because the specs play a major role in how close can you get to a certain players mechanics. While if you understand this, you might want to model the strokes that have proven effective for a player that uses a similar specs that you have.